They're everywhere now, or at least it seems like it. A year ago, I don't remember them being as prevalent in the hobby as they are today. But the question is, are they any good and worth listening to? I know that I've never been a big fan of them until recently. I've come across the occasional one that had a cool episode or two, but it was nver enough to keep me coming back as a "repeat" customer. I actually like to listen to them while I work on projects since my computer sits right behind me in my office and it's nothing for me to turn one on and listen while I paint or sculpt. It beats listening to the same 80's cd over and over again. I think I may be close to wearing it out if that's possible. But not being the expert, I figured I would ask someone who has some actual podcasting experience a couple questions. Enter Carl from The Independent Characters. QUESTION: How did you decide to get into Podcasting and why not just blogging or something easier? ANSWER: Actually I do have a blog as well though once the Podcast bug bit hard my blog has somewhat fallen by the wayside. For some reason the medium of audio really appeals to me. I think it was the ability to be as verbose as I want and speak off the top of my mind without a tremendous amount of editing that drove me towards Podcasting. I am also a big fan of other Podcasts and the ability to listen to others speak about the hobby I was interested in while commuting to and from work really helped. I have a rather lengthy commute each day and this certainly helps pass the time quickly. Also I felt that other Podcasts just weren't providing me what I was looking for. It is a tremendous amount of work and I have a huge amount of respect for those Podcasters who have been going at this week after week for years. I had enjoyed listening to them - but some just left me feeling like they didn't cover things I wanted to hear about. So I decided to fill that hole in my gaming life myself and strike out on my own... or in this case with a partner. My Co-Host, Geoff had recently moved to the area and we had hit it off pretty well. None of the other members of my gaming group were showing any interest in joining a Podcast, and I was debating asking Geoff if he was interested when he called me that evening and asked if I had ever thought of doing a Podcast. After telling him "I was going to ask you the same thing!" we put together a plan and got going. I am one of those people that if I am going to do something, I want to do it right and approach it with a solid plan. So we developed what is essentially our vision for the show and what our goals were. We did quite a bit of research before recording even the first minutes of the show. We wanted to be as prepared as possible before we put our voice out there. I think I knew it would be quite a bit of work - but the amount of pre and post production that goes into the show is actually quite staggering. That said it is extremely rewarding! We have more listeners than we ever expected at this stage of the game and our online community has taken off a lot quicker than expected as well. So the overwhelmingly positive response we have had to the show so far tells us that we have hit a nerve. We are always looking to improve the show however, and every piece of feedback we get in scrutinized. QUESTION: How does someone find a "good" Podcast to listen to? ANSWER: Easy. You just go to The Independent Characters - problem solved! In all seriousness though, there are a lot of great Podcasts out there, however not all Podcasts appeal to all people. Many of my friends like some 40k Podcasts out there that I have a hard time listening to. It's not that they aren't "good" podcasts; it's that they just don't speak to the material in a way that appeals to me. Most good Podcasts have a very specific agenda. The 11th Company Podcast focuses on tactics; The Gamers Lounge focuses on Sportsmanship and blogging. When Geoff and I started The Independent Characters we set out with one objective; Make our listeners feel like they were a part of our regular gaming group. Every time my friends get together the topic inevitably turns toward 40k and what we are doing, what Codex, rule or unit we want to complain about. We all sit around talking for hours talking about this hobby. Geoff and I figured that this would be a approach to a show. We decided to go after an audience with this approach since we figured most 40k Gamers are basically the same when it comes to what they like to talk about. Does this appeal to everyone? Of course not. Like any traditional radio program out there, try out a little bit of everything and see what you like and don't like. The explicit warnings that Podcasts can choose to put on themselves through iTunes are another factor you might want to take into consideration. There is no governing body around this so what one person considers explicit another might not. But as much as I love some Podcasts the language, when used excessively can detract from the message the hosts are trying to get across. With The Independent Characters we list our show with an explicit rating, however I feel our language is pretty tame overall. We basically go for a PG-13 level of Podcast. Speaking of iTunes, looking at how other people have rated the show on iTunes can clue you in a bit on what others think of the show overall. One problem with this is that it can hide newer shows, which might have great content in them, from you if you strictly go by this method. A dedicated website for the Podcast that is maintained and current can also go a long way towards showing you how dedicated the hosts are to putting out a quality show. Maybe that's just me but the overall web presence of the show means a lot. As a side note I would say that there are certain things you want to avoid when looking for a good Podcast. Bad sound quality is my number one gripe. We invested quite a bit of money to ensure our sound quality was good before we even started recording. Second would have to be a regular schedule. Though this is a hobby for most podcasters, sticking to a regular schedule will ensure that people who listen to your Podcast can feel invested in it. If the Podcast you are listening to has no set schedule, you might want to think twice about investing time in it. In the end though it really all boils down to listening to a few Podcasts and seeing what resonates with you. So give a few different ones a listen and see what you like! QUESTION: What's the one thing that Podcasting brings to the hobby that nothing else does? ANSWER: For one it allows you to take your hobby on the go! As I mentioned before I love listening to Podcasts while I commute to and from work. Although I would love to read a blog on my iPhone as I drive to work it's illegal here in California... and perhaps just a tad dangerous. Additionally, you can listen to Podcasts while you paint. I found this to increase my enjoyment of painting armies a tremendous amount. It can be difficult to watch TV or movies or do anything visual while painting, but listening to a Podcast is the perfect way to keep yourself going. So there you have it, from a professional podcaster himself. Podcasts are a great way to keep up with the hobby while you're stuck doing other things. I figured I would see what (podcasts) I could find out there too. This is not a complete list, just what I had links to. If you know of another one or you've got one yourself that I missed, email me or add it to the comments and I'll get it added to the list here. Note: Not all of these are "kid friendly," but I've added as many as I could find here in the interest of helping people find something that suits them and not just my own personal tastes. Podcasting for 40K is a great thing for the community. Being able to hear about multiple opinions about the hobby from all across the globe is a great thing. Just think of this, before podcasting you just had your gaming buddies to talk to and compare tactics with. Now with podcasts you can do the same with the rest of the world! So there you have it, a little commentary, some links, a picture or two... everything that makes a post great. Check out some of these guys and let them know what you think. There's a ton of work that goes into podcasting (way more than blogging), so lets support our 40k audio counterparts. I like the idea of podcasts, however I dont really have the attention span to sit and enjoy them. Even playing them during driving is likely to end with me yelling at other drivers (I drive into the DC area for work) and ignoring what comes over my speakers. I think podcasts are the worst way to communicate information - until there is automated transcribing and better tagging so they are searchable and indexable. Specifically when we're talking about hobbies they are as useful as having someone read a comic book out loud to you, pane by pane. Additionally in a written article you can scan over and skip uninteresting things, in a podcast you are obligated to listen to them. Charles, most podcast today include show notes with their podcasts with time codes for when each section starts. All you have to do is look up the code and skip to the next time code to skip a topic you are not interested in listening too. Ron, thank you for the great post. As a podcaster myself it is exciting to see all the new podcasts starting to emerge from the woodwork. As you said there are a lot of podcasts out there, each with it's own flavor and content perspective. No matter what you are into 40K wise I am relatively sure their is a podcast for you. I've got to say, I love podcasts and the recent explosion in podcasting has given me plenty to listen to. I don't tend to gain much from them due to their audio nature and this been a more visual/hands on hobby but for entertain whilst painting or whilst away from the pc, they're excellent. I especially like Gamers Lounge due to it's nature and the fact they have a blogging component as well as the fact both the guys are solid bloggers, so I feel like their more part of the blogging community with a podcast than guys with a podcast who also blog. I do wonder if we'll see a rise in vidcasting a la BoW style in the future but only time will tell. Thanks for the additioanl links bG, they've been added to the list in the post. Charles: For those who do read the comments, ther is a new podcast feature coming to FTW in the coming weeks... not an FTW podcast, but something that might help players out there. I'll have more info in the coming week. "you can listen to Podcasts while you paint. 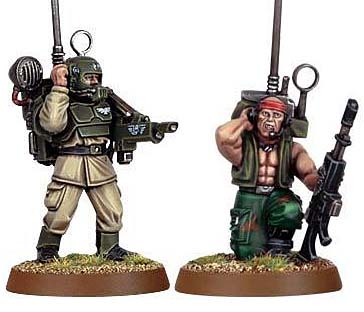 I found this to increase my enjoyment of painting armies a tremendous amount. It can be difficult to watch TV or movies or do anything visual while painting, but listening to a Podcast is the perfect way to keep yourself going"
This is spot on for me. Listening to others talk about the hobby while I hobby helps to immerse myself into it further and makes the whole experience more enjoyable. First, thank you Carl from the Independent Characters for mentioning our show :). Second, Thank you Mr. Ron for providing great content yet again. To the gentleman preferring articles(print) over an audio format, i completely agree, then again i like listening to things about my hobby more so than listening to the latest song or talk show. I follow dozens of blogs (i am not as big an addict as HuronBH) when i can. I DID warn you I was a bit verbose Ron! Seeing it in print on your site makes me think I need an intervention group or something. Thanks for the questions Ron and thanks to everyone who gave us a listen! Even if we are not up to par with everyone else we do put huge effort into it and enjoy doing it and I hope everyone enjoys listening. Thank you for linking us in your blog. @oniakki - Sorry to hear (no pun intended) that you have that problem. That must be extremely frustrating. regarding unlicensed music. For the IC's we actually utilize music that is "Podcast Safe" meaning the artists have intentionally released it for free use and availability on podcasts. Believe me when I say I have some favorite music I would LOVE to put in our show - but we are very aware of peoples rights to their own work. Thanks for mentioning us! (I had a incoming link on my blog). We are clean as clean can be so totally suitable for people for any age. Keep up the good work on From the Warp. We are also diversifying for those who are more all encompassing for the hobby! JJ - WER: NO problem, glad to hear you're branching out and keeping it clean too. That's a big thing for me when I listen.